The content of the French version is almost the same as that of the Japanese version, and includes the sections of “About Kuroda Seiki”, “Calendar and Traffic Access”, and “List of Works of Kuroda Seiki”. The French version is the fourth foreign language version after English, Chinese and Korean. In 1884, Kuroda Seiki traveled to France to study law, but after two years he switched to painting and followed that pursuit for the rest of his life. He often stayed and did many paintings in the small village of Grez-sur-Loing between 1890 and 1893, until when he returned to Japan. We hope that the people in France and other French-speaking countries will come to know that Kuroda Seiki, who is called the father of modern Japanese painting, had strong associations with France through the French webpages of Kuroda Memorial Hall. The Sainsbury Institute for the Study of Japanese Arts and Cultures was established in Norwich, in the eastern part of the UK, in 1999. 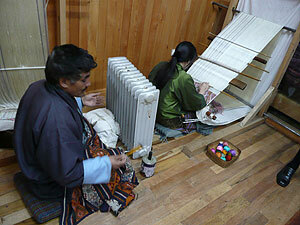 It is developing activities as a base for research on Japanese arts and cultures. The Institute’s Lisa Sainsbury Library stores books and materials on Japanese arts and cultures. 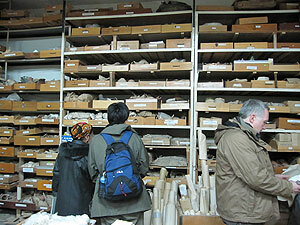 Among them there are collections on the ceramic artist, Bernard Leach, and the art history researcher, Yanagisawa Taka. The Yanagisawa collection has strong ties with the National Research Institute for Cultural Properties, Tokyo, where she worked. On February 25, the Department of Research Programming of this Institute and the Art Documentation Society co-hosted the workshop “Sainsbury Institute for the Study of Japanese Arts and Cultures and Archives of Cultural Heritages in the UK” in the seminar room of the Institute. 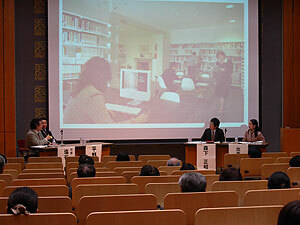 Mr. Hirano Akira, a librarian at the Lisa Sainsbury Library, was invited to participate. Mr. Hirano introduced the Sainsbury Institute for the Study of Japanese Arts, and reported on the study of Japan in the UK. He also discussed the network of Japanese studies in Europe. Mr. Morishita Masaaki (a visiting researcher from the Department of Research Programming of the National Research Institute for Cultural Properties, Tokyo) and Ms. Idemitsu Sachiko (a curator from the Idemitsu Museum of Arts), who have experience in conducting research based at the Sainsbury Institute for the Study of Japanese Arts and Cultures, joined in the discussions as panelists. They developed topics on the real experience of researching Japanese art in overseas countries and the current status of the archives on contemporary art in Europe. The discussions with general participants revealed that it is difficult for people in overseas countries to view the bulletins, theses and exhibition catalogs at Japanese universities, art galleries and museums, and gave us another opportunity to understand the real issues with their computerization and international cooperation. 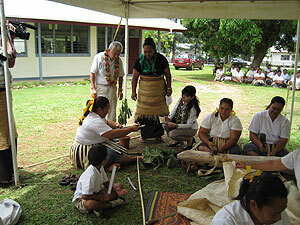 The Department of Intangible Cultural Heritage is surveying the protection status of intangible cultural heritage in the Asia-Pacific region in the framework of the UNESCO Convention for the Safeguarding of Intangible Cultural Heritage. 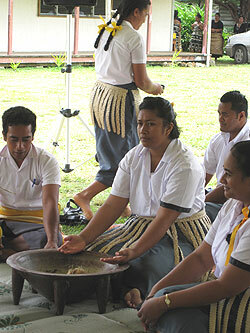 In February, we dispatched a mission to Thailand, Bhutan and other Pacific nations (Samoa, Tonga, New Zealand, Fiji and Palau) to listen to the persons in charge of intangible cultural heritage in governments and relevant organizations and exchange opinions. Thailand was strengthening its domestic structure for protecting intangible cultural heritage in anticipation of ratifying the Convention, and Bhutan started to record its intangible cultural heritage and create a database after ratifying the Convention and has made preparations for drafting a domestic law. The Pacific nations are keen to conclude the Convention, but have major issues in improving their domestic structures to implement the Convention. We plan to continue surveying what issues the Asia-Pacific region countries face and how we can have exchange and cooperation in the field of research on protecting intangible cultural heritage under the Convention. The National Research Institute for Cultural Properties, Tokyo is advancing “research on anti-seismic measures for clay and dry-lacquered statues” as part of its research project on disaster prevention plans for cultural properties. If we can find out how Shumidan and Hokke-do vibrate, we will be able to estimate how a strong quake will affect the statues of Buddha. 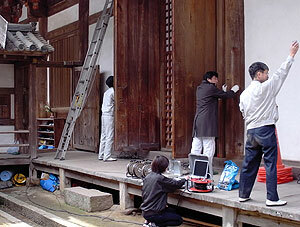 We obtained the cooperation of Mie University and others, and measured microtremors in Hokke-do and Shumidan. We will analyze the results, evaluate the vibration characteristics and quake resistance of Hokke-do and Shumidan, and use the data to develop seismic countermeasures for the statues of Buddha. 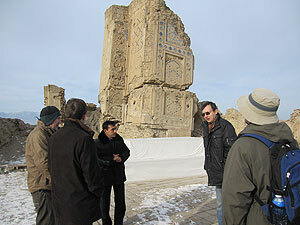 Prior to the documentation project (see the monthly report for January), the Japan Center for International Cooperation in Conservation dispatched a preparatory study team to Turkmenistan from February 14 to 18, at the request of UNESCO. This followed discussions with the related people of Central Asiatic countries (Kazakhstan, Uzbekistan, Kyrgyzstan and Tajikistan) in January. The major purposes of this dispatch were to investigate the activities in Turkmenistan with this project, and confirm the research system and archive storage being conducted by those in Turkmenistan. We discussed the direction in which the project should head in the future and their specific operations with the relevant persons in Turkmenistan. Then we visited Anau, which is one of the candidate sites for registration as a Silk Road World Heritage site, and the national museum, which stores many great artifacts of ancient Turkmenistan. Turkmenistan is home to the Zoroastrian ruins and Buddhist temple ruins which are the westernmost of the temple ruins that have been discovered so far, and we can trace the footprints of various kinds of culture there. 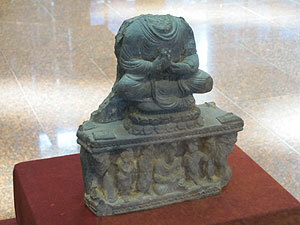 This area is a treasury of cultural heritages representing areas situated along the Silk Road. We plan to actively implement studies on cultural heritages in Central Asia including Turkmenistan, and help develop human resources and transfer techniques.